When it comes to golf, opinions about the game is definitely polarized, or at least split right down the middle. After all, golf widows will tell you of the different kinds of reactions they have each time their husbands return home with a new set of golf clubs, and sharing just what their future timetable will be like when it comes to the week’s golfing sessions ahead. Since you yourself do not like the game of golf and yet would like to know his friends better, how about arriving at a compromise? This win-win situation will require the $49.99 Floating Golf Game to be part of your home – assuming you have a swimming pool in the first place, of course. 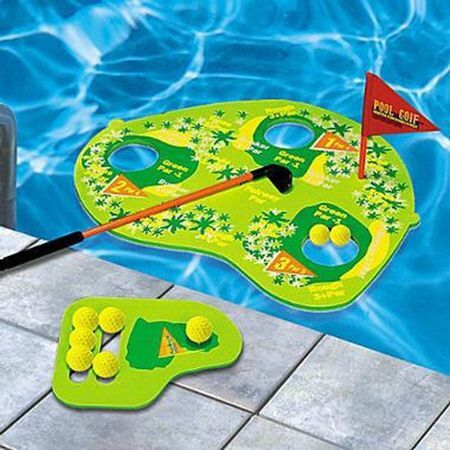 The Floating Golf Game is said to be a hit in or out of the pool, although it is a whole lot more fun in the pool. This fun game will definitely test your golf skills to the limit, since you can always try to chip your ball onto the floating green, or to practice your golf swing at the time of your choice. Either make use of that new club you just purchased, or the included plastic one that arrives with each purchase. Each Floating Golf Game will include a floating soft foam 3-hole pool green with golf flag and pole, a tee-off pad with storage slot for balls, a 27″ golf club with handle grip, and 8 soft foam balls.